Social Media Marketing is something of a hot topic at the moment, and because of that fact, many people believe that email marketing is dead. Conversely, and far to the contrary, others suggest that email is still more valuable and offers more conversion than social media ever will. At the end of the day, people will argue for their favourite promotional method, often without providing any real facts. If you want to know what’s really best for your business, keep reading to see Social Media Marketing and Email Marketing go head to head. We’ll cover pros, cons, benefits, and basic tactics of each and then give you a basic summary. Social Media Marketing, otherwise known as SMM (which we will use for the rest of this post for the purpose of brevity) is quite literally what’s in fashion at the moment. Everyone is involved and everyone is doing it, even if they happen to be doing it wrong. Because dozens of businesses have gone viral almost overnight with social media and many more use programs to convert fans and followers into customers, it’s definitely not something you want to ignore. The basic pros of social media marketing include that it is the easiest and fastest way to get your content and business out in front of as many people as possible. If you have something great to say and say it in an engaging way then people will listen. However, SMM is very easy to abuse for those who do not know what they are doing or who simply don’t care. Buying followers, fans, and likes can look good to new fans, but it eventually creates a downward spiral and a very low engagement percentage because these fans are most often not interested or even real. As a result, SMM is only valuable to the company willing to put in the time and the money to network, promote, and gain active, interested fans. Email marketing is a much older form of promotion and involves sending emails to people who opt-in via a contact form. Emails can be written in advance (drip marketing) or sent out with news, new products, and alerts to customers based on the sales method and the consumers preference. indicated an interest in products, services or sales. The main disadvantage of email marketing is that it is limited to the number of people who choose to sign up for the mailing list. Another disadvantage is that a poorly written newsletter or email will be flagged as spam and filtered by the users email address. Because subscribers often find repetitive, overly promotional, and too frequent emails annoying the best practice is to hire a quality company that specializes in email marketing, like SocketLabs.com. 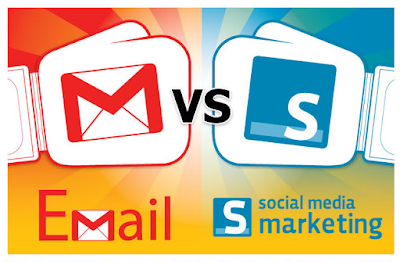 At the end of the day do you choose an email marketing platform or a social one? While you might be tempted to go with the option that looks like it is best for your business, you can probably get a lot more success by going with both. Social media and email complement each other in that you can use your Social to build a brand reputation and brand engagement, and even to promote your newsletter. With your emails making more sales, you can promote less on your social (which often leads to better social engagement) and focus on selling through your newsletter while providing helpful information and tips on your social. SMM and Email are both very valuable forms of marketing and you shouldn’t discount either. However, an email subscriber is more valuable to you as a business than a social fan or like (or even ten social fans), and you should keep this in mind when allocating your time and money towards either program. George Torres - Author - Thanks for this great article!